2019 will be a year full of exciting initiatives and professional gatherings for the IACC. 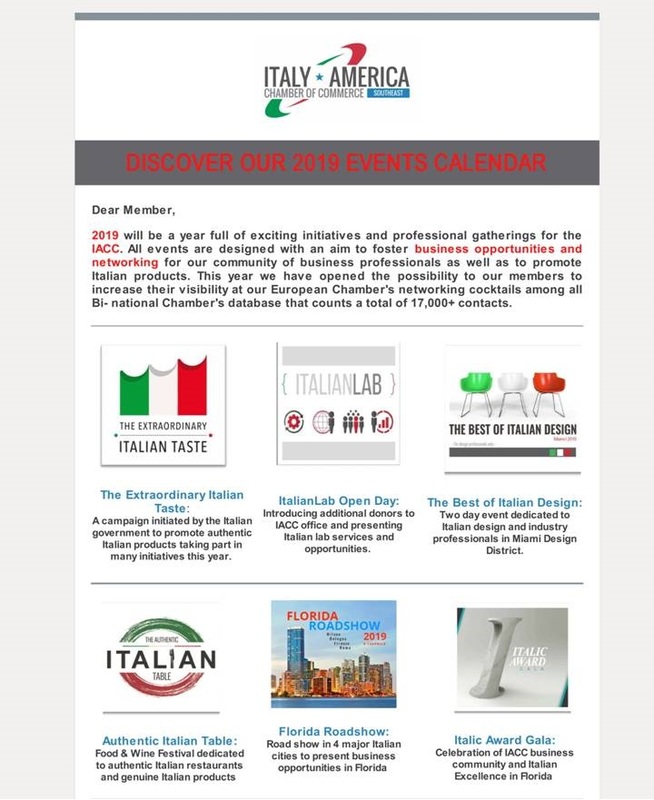 All events are designed with an aim to foster business opportunities and networking for our community of business professionals as well as to promote Italian products. The Best of Italian Design will take place during the month of May. This is an event dedicated to the design industry, particularly, furniture manufactures wishing to create business ties in Florida specifically with architects and interior designers. The event will take place in the Design District in Miami and will last two days. Guests will be invited to a tour of 4 top showrooms where there will be product presentations. There will also be a symposium with renowned Italian designers invited as guest speakers. Additionally, there will be the second edition of the Authentic Italian Table that will take off in the beginning of November. The Authentic Italian Table is organized as a food and wine festival to celebrate authentic Italian restaurants and genuine Made in Italy products. This event is also part of the “Extraordinary Italian Taste” project initiated by the Italian Government. And the list goes on. Check the complete calendar of events to make sure you don’t miss valuable opportunities for you and your company. View below to download our full 2019 calendar events with more event details! Take advantage of the full season of events and become a member today!